That’s a popular strategy to avoid what some say are the worst six months of the year. As with all market sayings, it’s important to dig deeper. Stock markets date back to at least the 1600s. We still define the market in terms of the rivalry between the bulls and the bears. That shows how little has changed in the past 330 years. As de la Vega was writing, London was quickly replacing Amsterdam as the world’s most important stock exchange within 50 years. By the time the first stock market bubble formed in London in 1720, more than 600,000 lived in the city. Those people and the livestock that roamed the dirt streets created tons of waste every day. Much of that waste ended up in the Thames River. That’s why we hear “sell in May.” Selling allowed brokers to leave the city before the worst of the summer. The St. Leger Stakes is a horse race held every September. Anthony St. Leger organized the first race in September 1776 to mark the unofficial end of summer. As professionals returned from the country, stocks rallied as investors put money to work in the market. So, the Great Stink and a horse race explain why we sell in May and go away. Now that we know why traders say “sell in May,” there’s really no reason to have faith in that old saying. But because it’s such a popular idea, we should test it. “Sell in May” divides the year into two halves. The “worst” six months begin in May and end in October. The “best” six months run from November through April. To test the strategy, we could hold stocks only during the best six months. This strategy has worked well in the past 30 years. In the Dow Jones Industrial Average, holding stocks in just the best six months would have delivered 85.4% of the returns of a buy-and-hold strategy with about one-third of the risk. There were just three losing trades in that time. Since 1900, the best six months have captured 86.7% of the index’s total gains. The strategy delivered gains 67.5% of the time. Risk was considerably lower than a buy-and-hold strategy. The worst decline was about 39%, while the buy-and-hold investors lost as much as 90% in the Great Depression. Overall, the strategy delivers nice returns and reduces risk. This is where many analysts stop their analysis. But I have another 400 words to write, so I will go further. One way to improve the strategy would be to reconsider the sell rule. In simplest terms, the goal of investors is the same now as it was at the time of Joseph de la Vega. They want to own stocks that are going up and sell when prices are falling. To improve on the “best six months” strategy, we could continue holding until prices start falling. Instead of selling based solely on the calendar, we could add a momentum indicator. The rule then becomes sell in May (or later) when momentum is bearish. The chart below shows how this revised strategy works. Red bars show the worst six months. At the bottom, the blue line is the VIX Flip Indicator. The VIX Flip shows changes in the emotions of traders. It’s an indicator specifically designed to track fear. When the indicator moves higher, the level of fear in the market is rising. In the chart, the black line is a moving average of the indicator. The moving average smooths out day-to-day swings. It shows the trend. It also lets us see when the trend changes. By adding a moving average to the indicator, we can spot when emotions change. When the indicator moves above its moving average, fear is rising. That’s time to sell. If fear is falling, the indicator drops under the moving average. That’s a buy signal. Blue dashed lines show the first VIX Flip sell signal that occurs during the worst six months. In this test, I sold on the VIX Flip sell signal. In some years, including 2010 and 2011, the VIX Flip was bearish on May 1. In those years, the strategy sold on May 1. In other years, the signal delayed selling by a few weeks. 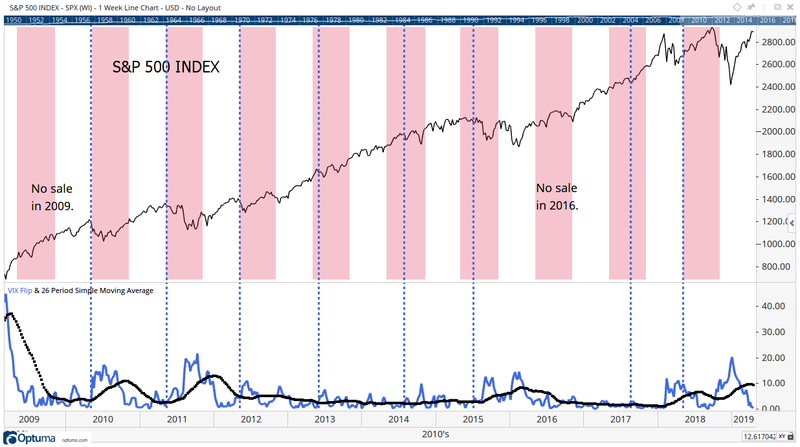 In 2009 and 2016, the indicator remained bullish the entire six months. With this rule, we hold stocks while the trend remains up. This simple change beats buy-and-hold over the past 30 years. It delivered 104.6% of the total return of the Dow. Risk is unchanged at just one-third of the buy-and-hold strategy. Testing back to 1900 shows the same result. Over that time, the modified “sell in May” strategy delivered 104% of the Dow’s total return while reducing risk. Any momentum indicator can modify “sell in May.” Instead of VIX Flip, you could use moving average convergence/divergence or stochastics. The results show the value of combining seasonal and momentum strategies. It also applies some logic to a rule that dates back to the 19th century and has stood the test of time.